While humans are decades away from potentially becoming an invasive species on Mars, it’s not too soon for NASA to think about how astronauts will feed themselves when they arrive. A question like “How much water is needed to make a beef tagine?” must be answered by engineers well in advance. 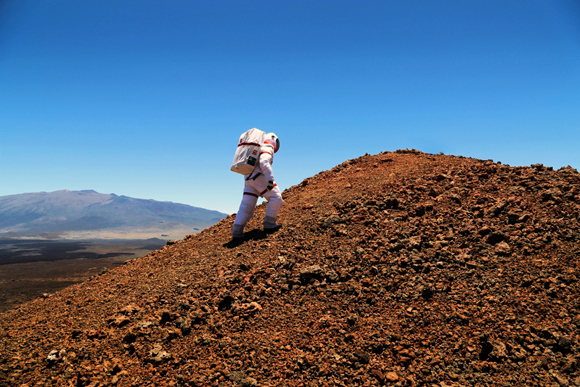 Funded byNASA’s Human Research Program, the Hawaii Space Exploration Analog and Simulation’s four-month mission is to compare classic astronaut fare of pre-made, prepackaged meals to a new system that allows for combining a limited number of shelf-stable ingredients. Yet, prepackaged meals hold an obvious appeal in space, for largely the same reason a housebound crew on Earth stocks a freezer with Hot Pockets: convenience. “Packaged foods are going to be around forever,” said Michele Perchonok, who leads NASA’s Advanced Food System team, at the Johnson Space Center, in Houston. “We’re never giving that up completely.” One ofNASA’s challenges for Mars, she explained, is to come up with pouched foods that can last for up to five years. Currently, the agency has around seven meat items with that kind of shelf life; it is striving to develop new ways of processing, packaging, and storing these foods.